This crispy potato and red pepper bake has just the right amount of spice. Serve with a fresh green salad after just 30 minutes baking time. 1. 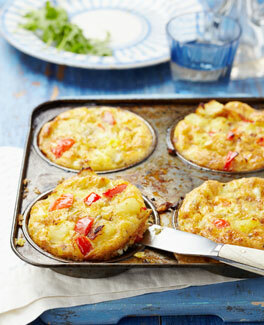 To make these delicious potato and red pepper bakes, simply preheat the oven to 200C/Gas 6. Heat the oil in a frying pan, on a medium setting, and add the chopped chili, pepper and tomato. Duringt cooking, add salt and pepper, to taste. 2. Add the beaten egg to the mix, stir well and then separate the mixture into a non-stick baking tray with four holders. Place in the oven for 20-30 minutes until the egg is firm and the mixture has set. 3. Serve with spinach or a crispy green salad and enjoy!